Home→Unique Claims to Fame→Mystery Hole Ansted, W.Va.
Is the Mystery Hole just outside of Anstead, W.Va., a unique location where the laws of gravity have somehow gone haywire? Or is it merely a cleverly constructed subterranean attraction designed to make visitors think so? The real answer is one owners Will and Sandy Morrison are disinclined to divulge. “You just have to see it to believe it,” Sandy said cryptically, and Will claims to have turned down several million-dollar offers to reveal the secrets of the Mystery Hole. 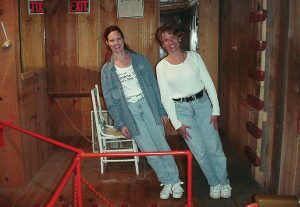 Some of the weird phenomena include people appearing to stand on a slant, balls rolling uphill and furniture precariously balanced at impossible angles. “This believe-it-or-not astounding experience has intrigued many people both young and old over the years,” touts the website, www.mysteryhole.com. The website even issues a lighthearted warning to visitors. “One lady said it changed her husband from an old grouch to a nice, sweet person, and some have even complained the admission price is too low and insisted on giving a tip. 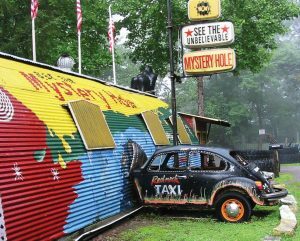 The Mystery Hole is one of a dwindling number of holdovers from the era of kitschy roadside diversions back in the day when gasoline prices were reasonable and automobile travel reigned supreme. The site’s kaleidoscopic jumble of colors and incongruous images match the delightful hyperbole of the attraction’s website. 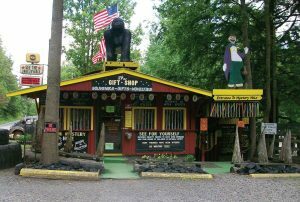 Depictions of a clown and black bear greet visitors to the rainbow-colored quonset hut and the adjoining gift shop and a Volkswagen Beetle is placed so it appears to have crashed into the building. The gift shop offers T-shirts, hats, bumper stickers, shot glasses, coffee mugs, postcards and a host of West Virginia souvenirs. 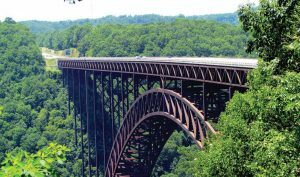 The Mystery Hole is situated near the New River Gorge, site of the famed New River Gorge Bridge and a mecca for rafters. Sandy said “thousands and thousands” of visitors have enjoyed the Mystery Hole during the Morrisons’ tenure, now in its 20th season. They bought the place in 1999, becoming the second owners of the attraction “discovered” by Donald Wilson in 1972. He closed the Mystery Hole in 1996 and died shortly thereafter. For years the property was subject to vandalism and deterioration and the Morrisons invested a substantial amount of resources and elbow grease into restoring the site while preserving the character some have described as “cheesy, tacky, corny, authentic and as a result utterly brilliant,” according to Yelp contributor Donal F.
Nearby Ansted, with a population of 1,404, does its share in promoting the attraction and benefits in return from tourists heading into town for gas, food and lodging. The 15-minute guided tours are $7 for adults and $6 for children 11 and under. The Morrisons will open the attraction on their off days for tours of 20 or more visitors. The attraction is open Memorial Day, Fourth of July and Labor Day. The Mystery Hole is currently up for sale, according to Sandy. “We do well,” she said, but noted it was time for her and Will to move on.